Brandi Disterheft caught our writer's ear even before she put out her first record. She hasn't disappointed since. I first heard bassist Brandi Disterheft’s playing on the fine 2003 release Introducing The Laila Biali Trio. At the time I was making a point of interviewing young jazz musicians for my radio show Jazz Notes. Soon after, I approached her about doing an interview. At the time she was living in Toronto and honing her skills by playing in various bands. I think she was surprised that I wanted to interview her, because she had yet to put an album out as a leader. But she agreed. She had a very young sounding voice, but I was impressed by her confidence. She was very knowledgeable about jazz and the jazz tradition. My instincts were that this young lady was going to go places. In 2007, I had the pleasure of hearing her play live, when she toured as part of the Richard Whiteman Trio. I thoroughly enjoyed the show. Later in 2007 she independently released her first album Debut and included me (among others) with a thank you in the liner notes. I was surprised and delighted and interviewed her again. Her second CD, Second Side, now on Justin Time spawned another interview and some changes in the style of music she was playing and the addition of vocalists, including Brandi. Soon after, I got to hear her play for the Vernon (B.C.) Jazz Society, later that year at the Vancouver International Jazz Festival and some time in between at the Ashcroft Opera House. 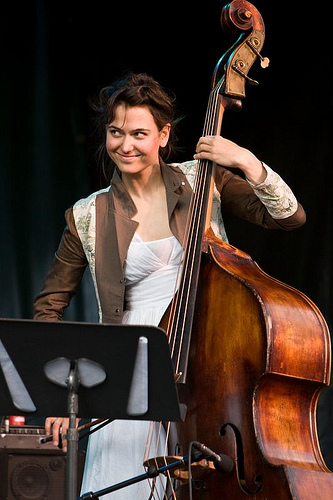 Brandi Disterheft has since moved to New York and for a time studied with the great bassist, Ron Carter. Earlier in November she returned to Canada and brought a trio into the Shuwap Theatre in Salmon Arm, B.C., as part of her fall Canadian tour. This gave me an opportunity to catch up with this talented, young woman and talk about her new CD Gratitude that was recently released on the Justin Time label and climbed quickly to Number 1 on the Earshot charts. I spoke with her after her performance that evening. JD: How are you doing Brandi? BD: I’m doing great, thanks. JD: Did you enjoy playing tonight? BD: Yes I did. It’s such a beautiful theatre, here and the band sounded great and the upright piano gave it such a flavour. We’ve been touring across the country, so the band is definitely warmed up. That was a very, beautiful audience, too. JD: Yes, it was. I had the pleasure of sitting exactly in the middle of the theatre and I haven’t heard sound that was that clean and clear in a long, long time. It was really a pleasure being in this theatre in Salmon Arm. BD: Oh great, I’m glad. That’s exactly what our piano player Dan Kaufman said. JD: Where did you find Dan Kaufman? BD: I met him at a jam session in New York City. He’s originally from Chicago. We played together as side-men in a trumpet player’s band, Dominick Farinacci. Then, I started hiring him for some gigs and asked him to play on this tour. What’s so great about Dan is that not only does he have great facility and great touch and a great feel and he can play modern, but he also has a real respect for the tradition. He also plays stride and he isn’t afraid to still portray the tradition, which I think is so important. He makes the music sound so romantic, like the albums I still listen to. JD: You are definitely right. While he was playing you could hear elements of classical, New Orleans, and like you said stride, at different times. The ballads were just beautiful. It was just wonderful playing. And, you had your old buddy from Vancouver playing drums with you, I guess the kids call him “Morgs,” and that would be Morgan Childs. BD: You got it, Morgs, ya! We first met in Vancouver in our early twenties and did the Banff Workshop together. He’s always been such a great supporter saying things like, “Brandi you lay down beautiful time.” We’ve become really great friends. He plays with Amanda Tosoff and many other bands. He has that feel; that sound; and again, not afraid of playing the tradition, which I really like, so the music really swings. JD: Yes, it really did tonight. So you have a new CD out called Gratitude. It just happens I have one in front of me, with some lovely pictures of you on the cover. It mentions your Juno Award and other information. Speaking of having good bands with you, this band is “scary” good. Tell us about the new CD. BD: It features Renee Rosnes on piano. She is from the same high school I went to, Handsworth (North Vancouver). She has such beautiful swing and a light touch. I have Gregory Hutchinson (the late Ray Brown’s drummer) on drums. He’s a machine and one of my favourite drummers in the world. I asked him to be a part of it and he went through the music and we really hit it off. I’ve got Sean Jones on trumpet, who was in Wynton Marsalis’ group (Lincoln Center Orchestra) for years. He’s a true virtuosic trumpet player. I remember meeting him at summer camp when I was quite a youngster. He had tears streaming down his eyes and he said, “Playing music is all about portraying love; expressing love; it’s all about love.” He’s just a beautiful guy and truly one of my favourite trumpet players in the world! Then, I have Vincent Herring on alto saxophone. He plays with Cedar Walton’s group and now Vincent Herring has asked me to join his band and we’ve been doing some dates up at Smoke in New York City. Eric Alexander and Cyrus Chestnut were on the last one. So I thought it would be great to have him on the album. I’ve been playing jam sessions at his house for the last few years in New York City and whenever he plays he has such monstrous sound that he shakes the windows in his living room. Then, I have one of my very good friends, Anne Drummond (Kenny Barron’s flautist) on flute. She’s a composer, herself and a great band leader. JD: Now getting into the CD, one of my favourites is a song called “Open,” that you penned and I could see the intro to that being the theme for half-a-dozen CBC shows. What do you think about that? BD: That’s the best idea I’ve heard yet (laughs), Jim. Thank you. “Open” is a real swinging song. It means that we have to keep our minds open and not have tunnel vision and be open to change, since the world seems like it is changing quite quickly now, with the economy and we sort of have to re-invent ourselves. Ya, I really love that song. JD: You mentioned emotion and love. There are two songs on Gratitude that have a lot of emotion. Tonight you played the title track and I could see tears in your eyes and emotion came through on your instrument and not just on your face. Brandi, would you tell us about that? BD: Ya, thanks. The title track is “Gratitude” and there are many things that I am grateful for. I’m grateful to be able to perform and play with such great musicians. But I wrote this song for my cousin David, who suddenly fell ill. We thought he’d make it through, because he was about my age. Then we got the call that he was robbed of his immortality and that he had passed away. He was like a brother and it was pretty hard on the whole family and I wrote the song “Gratitude” to be grateful for his life and to celebrate our memories and our family. The music just poured out of me. I actually wrote a suite and this is just one part of it and I’d like to release the other parts, too. JD: Ya, you could tell that there was probably more to that, but we are all aware that there is only so much space on a CD. That brings me to another track I really like by Renee Rosnes called “Mizmahta” and she wrote is for a friend of hers, and it almost means Miss Mahta. It is one of my favourite tunes and you can really hear how beautiful the writing is and it’s a great blowing vehicle and she sounds phenomenal on it. It’s just cooking! It was a real treat playing with Renee, because I grew up listening to her music. She was such an icon; not just a female icon, but coming from North Vancouver and playing with the heavyweights. That speaks for itself. She was a real sweetheart, too. JD: I’ve heard that about her. I’ve seen her in concert six or seven times in my life and it’s just been my pleasure. I’ve seen her since she was quite young and I saw her with Bill (Charlap, her husband) when they did the two piano show at the place that used to the called The Centre at the Vancouver International Jazz Festival. That was just a lovely, lovely show. JD: So you truly do have impressive band mates on this CD. There’s a track from Jimmy (Van Heusen) and Johnny (Burke). They are one of my favourite composing pairs. You chose their classic standard “But Beautiful.” Why did you pick that one? BD: I love the lyrics. It’s basically saying that the most important thing is to love. Even if it goes sour it’s still beautiful and so many greats have recorded it from Billie Holiday to Nat King Cole, Freddie Hubbard, Nancy Wilson. I wrote an introduction to it, which is sort of comical and sets up the tune. It’s just a beautiful standard. JD: It surely is. After you finish this fall tour with the trio what do you have planned? BD: After I get back home to New York we are playing at The Lincoln Center at Dizzy’s for the CD release with the guys from the album. So, that should be a highlight to come back there and play. We are hopefully heading to Europe in the spring and we will be doing the jazz festival circuit in the summertime. JD: That’s awfully good to hear. I know you have to get moving, so best of luck on the rest of the tour. BD: Thanks so much Jim. It was great to see you again.